With Singstar being one of the most popular gaming franchise ever created, it's understandable that Microsoft would like to get in on the action and give owners of the 360, a chance to experience karaoke like they have never experienced it before. Created in conjunction with iNiS, one of Japan's most popular development companies, Lips not only gives 360 owners a chance to experience "Singstar" but they also add their own unique twists and spins to the game. Two wireless interactive microphones. Featuring stylish interactive motion sensors and lights, the microphones respond to singers’ actions and can be used as percussion accompaniments. With the freedom and encouragement provided by the high-quality wireless microphones, everyone can live their singing dreams in style. The best music. “Lips” will include a diverse selection of songs, including your favorite blasts from the past such as “Bust a Move” by Young MC, as well as new songs from breakout artists such as “Mercy” by Duffy and “Young Folks” by Peter Bjorn and John. Play along. 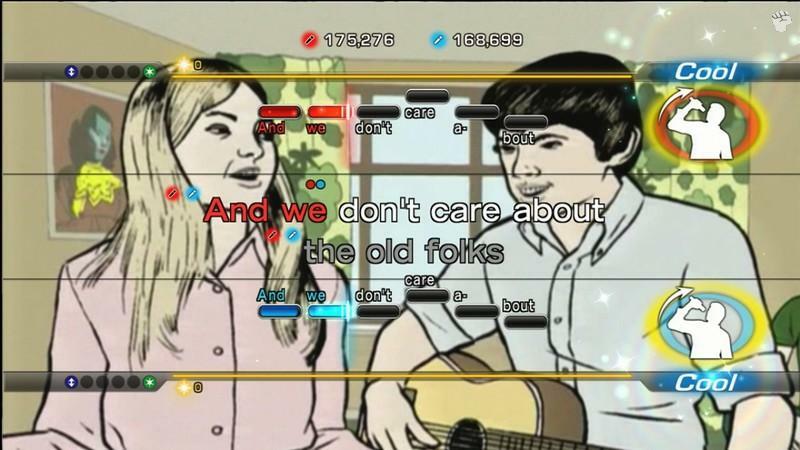 Using the standard Xbox 360 controller, up to two people will be able to join the fun and choose from a variety of percussion accompaniment to play along with the music in “Lips.” By placing control of various tambourines, claps and of course the ubiquitous cowbell at the fingertips of anyone with a controller, “Lips” creates a social entertainment experience for friends, co-workers and kids alike. Constant flow of new music. From the songs that will come with the game, to your own music collection and the ability to download new tracks from Xbox LIVE Marketplace, “Lips” will continually provide new music to bring people together and keep the party going. With that said, Lips is not a karaoke game but rather a virtual karaoke game that awards the player with their pitch and timing as they sing, hum and generally have one of the best interactive music experiences ever. Best of all, Lips on the XBox 360 is wireless and once you have installed the two AA batteries which come with both mics, it's time to start belting out those lyrics and unleash your inner Rock Star. 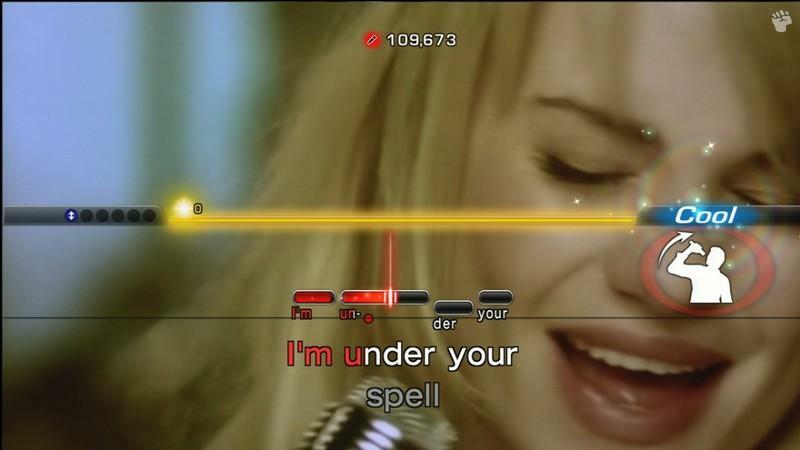 Unlike the Singstar microphones, Lips features a white and a black microphone that also have coloured lights to assist with the atmosphere and assist you with the correct words to sing. A nifty feature is the Star Stream that once you reach a certain level, you need to use the motion sensors on the microphone to create a pose or use it to play some percussion instruments. Although not vital to the gameplay, it does make for some interesting twists. As with Singstar, the gamer has a wide wealth of gaming options, including the ability of short and long songs plus the ability to purchase songs online. A really cool feature is the ability to shake the second microphone in order for the other player to join in, another fun feature! As a party game, Lips succeeds and has some great cooperative and competitive multiplayer modes. Other multiplayer modes include "Kiss" where two people attempt to sing in harmony in order for the silhouettes of a man and woman to meet in the middle of the screen for a longing kiss. Time Bomb uses the microphones motion sensors and the songs to pour water on a burning fuse and finally there Vocal Fighters which is a great versus mode involving some interesting point twists. When it comes to songs, there are a total of 40 songs available that include classics (Queen - Another One Bites the Dust), modern hits (Coldplay - Yellow) and even a few Australian hits such as John Farnham. It's great that Microsoft have targeted different songs for different regions in the world, ensuring that gamers of all countries are catered for. A really great feature of Lips is the ability to import your songs into the program, however you need to know the words for the song as no words or video is displayed. It would have been nice if there was some kind of editor that allowed you to add the words to the screen. It's an interesting feature that needs some tweaking, however for now, Microsoft have tried and almost succeeded in breaking the Singstar franchise. Interface wise, Lips does take some time getting use to, however Microsoft have truly created a professionally looking product that have allowed XBox 360 owners to have their dreams made true. Gameplay wise, Lips has a few more bells and whistles than Singstar and is actually a tad easier than Singstar, albeit the rap songs are still a tad difficult, it's still a great time to be had be all. Although not perfect, Lips is still a worthy investment for the XBox 360 and as add-ons and songs are released for the system, the franchise will only continue to improve. Even though most of the mini-games in Lips are just for novelty, the game is still a decent virtual karaoke experience and the wireless mics are a huge bonus to this genre. Definitely a must have game for the Holiday Season! Aly & AJ - "Potential Break Up Song"
Radiohead - "Fake Plastic Trees"
The Ramones - "I Wanna Be Sedated"
Roxette - "Listen to Your Heart"
Taylor Swift - "I'm Only Me When I'm With You"
The Raveonettes - "Love in a Trashcan"
Lil' Mama - "Lip Gloss"
Trace Adkins - "Ladies Love Country Boys"
Lupe Fiasco (featuring Matthew Santos) - "Superstar"
Cold Chisel - "Khe Sahn"
Men At Work - "Be Good Johnny"